Due to the nature of how filesystems like NTFS work, files that are deleted "permanently" from within Windows aren't immediately deleted - they're simply marked as deleted from the Master File Table (the hard drive's index) and therefore inaccessible from within the operating system using normal means. This means that although a little harder to get to, they still exist on the drive until the space they occupy is overwritten by a newer piece of data, which can be never at all depending on how much free space the hard drive has. This makes deleted data easily recoverable to anyone capable of using dedicated data recovery tools like Recuva and GetDataBack. On Windows, the wiping of free space is usually done via a (usually bloated) third-party GUI, despite the fact that it can be done relatively simple via the command-line in Linux. Does such a command-line tool exist for Windows? 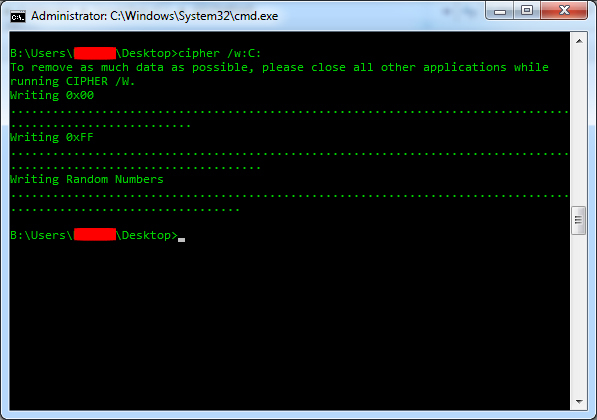 Such a tool exists in the form of a little-known Windows utility called cipher. cipher.exe has been included in Windows systems since Windows 2000, and had the original purpose of encrypting and decrypting files and folders using EFS encryption. Note that cipher's syntax is slightly odd in that it requires at least one colon after the /w switch, followed by the drive letter of the drive that you want to securely wipe. If your system contains both a boot (i.e. Windows/system) drive and a data drive, you'll want to wipe both separately with cipher /w for maximum security, or wipe just the data drive to cover yourself for most purposes.